Although the Catholic Church has always opposed nuclear weapons, the Vatican reluctantly acknowledged during the Cold War that mutual assured destruction was the best-worst option for averting catastrophe. Today, a dramatic declaration from Pope Francis reversed that position. "Nuclear deterrence and the threat of mutually assured destruction cannot be the basis for an ethics of fraternity and peaceful coexistence among peoples and states. The youth of today and tomorrow deserve far more…. Peace must be built on justice, socio-economic development, freedom, respect for fundamental human rights, the participation of all in public affairs and the building of trust between peoples." "I am convinced that the desire for peace and fraternity planted deep in the human heart will bear fruit in concrete ways to ensure that nuclear weapons are banned once and for all, to the benefit of our common home." 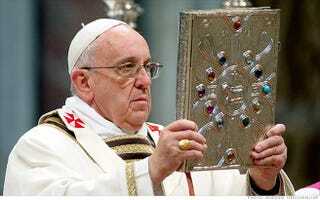 "The consistent position of the Vatican has been against atomic weapons. From the very beginning, from John XXIII in 'Pacem in Terris' onward, there has been a consistent line opposing the use, the possession, the development of nuclear weapons. During the '80s, especially during the cold war, the use of deterrence was accepted as a condition for avoiding worst results, but not as a value in itself." But, Tomasi says, the ongoing spread of nuclear weapons in a multipolar world, along with the threat posed by terrorists stealing fissile material, have made the weapons more dangerous than ever. "So we go back to the principal that the possession and use of atomic weapons is not at all acceptable." The document details failures of deterrence that might have led to nuclear war, including nuclear accidents, malfunctions and close calls. The Holy See statement calls for scrutiny of the belief that nuclear deterrence "is a stable basis for peace." A Vatican official went so far as to describe political fealty to the strategic policy of deterrence as "religion" in its own right.